Developmental disabilities affect millions of people and have a great impact on their lives, their families and the societies where they live. The prevalence of disorders such as autism, attention deficit hyperactivity disorder as well as subclinical decrements in brain function cannot be explained solely as genetic diseases. Exposures to environmental chemicals, especially during prenatal and early postnatal life, are one likely explanation for some of the decrements. The current chemical risk assessment approach is typically based on the toxicity caused by a single chemical on a variety of organs without acknowledging additional exposures to other chemicals also affecting the same organ or system. We identified more than 300 chemicals allowed in food that may have potential harmful effects on the developing brain. Each individual chemical may or may not have a harmful effect if it were the only one present, but we know next to nothing about their cumulative biological effects on the brain. 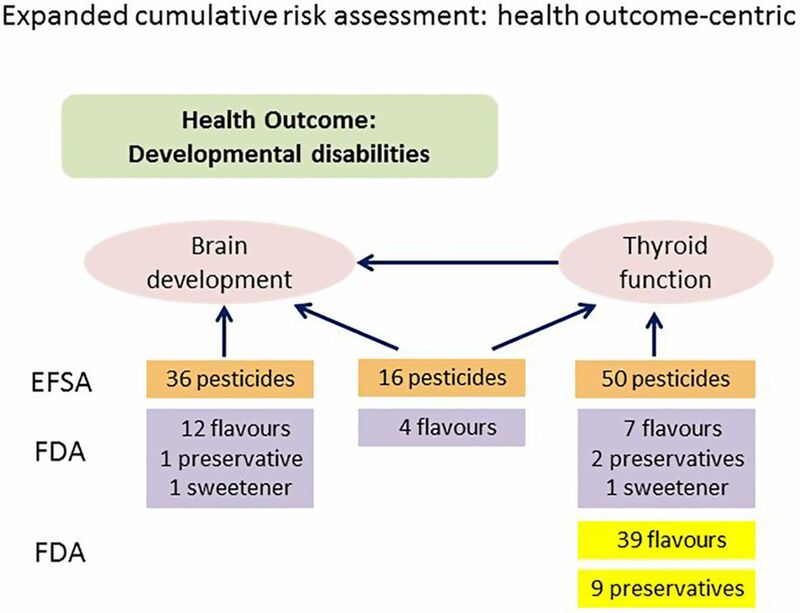 An expanded cumulative risk assessment approach is needed, and it should focus on health outcomes, like developmental disabilities, arising from the accumulation of effects of multiple chemicals on the brain. The laws regulating the safety of additives already require that regulators in Europe and the USA consider cumulative effects; so far, they seem to have neglected the mandate. We must move beyond treating chemical exposures as isolated incidents and look at their cumulative biological effects on organs and their role in the onset of chronic diseases. The time has come to overhaul chemical risk assessment. According to the WHO, non-communicable diseases underlie almost two-thirds of all global deaths,1 and its incidence has increased over the past 40 years, in part due to environmental chemical exposures.2 For instance, in the USA, an estimated 10 million children have a developmental disability. This represents 15% of all children aged 3–17 years with the prevalence on the rise. Autism increased by 290% and attention-deficit hyperactivity disorder (ADHD) increased by 33% between 1997 and 2008.3 The increases in autism and ADHD reflect worldwide trends.4 These measures, however, do not capture subclinical decrements in brain function that may be even more common.5 In this commentary, we use brain development and developmental disabilities as a case study for reforming chemical risk assessment methods. Grandjean and Landrigan aptly noted that developmental disabilities “can have severe consequences—they diminish quality of life, reduce academic achievement, and disturb behaviour, with profound consequences for the welfare and productivity of entire societies.”5 Bellinger estimated the total number of full-scale IQ (FSIQ) point losses in more than 25 million American children between the ages of 0 and 5 years. A loss of almost 40 million FSIQ was associated with environmental chemical exposures to lead, methylmercury and organophosphate pesticides.6 Two recent articles also estimated the economic impact of chronic children’s diseases attributable to environmental exposures. Bartlett and Trasande7 estimated that the cost of childhood lead and mercury exposures and developmental disabilities could reach almost 70 billion dollars in the European Union. Trasande and Liu8 performed a similar analysis for environmentally mediated diseases in American children with comparable results. With genetic factors appearing to account for no more than 40% of all cases of neurodevelopmental disorders, environmental exposures must be significant contributors to this global pandemic5 and thus must be given serious consideration. Unfortunately, a combination of scientific and regulatory inertia, together with insufficient funding for innovative environmental health research, has delayed in recognising the role that environmental chemicals—including those used in food—play. Equally important is the continued and significant lack of connection between the bookends of environmental health: the healthcare professionals and the risk assessors. The former are confronted with a health outcome, that is, a disease, syndrome or disorder, and attempt to identify the causes, whether environmental or otherwise. The latter start with the chemical exposure and are responsible for identifying associated toxicity to organs, whether it be the brain, the thyroid, the kidneys, the liver or any other part. This great divide is bridged when the neurotoxicity evidence is compelling such as in the cases of lead and mercury exposures. Starting in 2006, Grandjean and Landrigan9 made significant progress in strengthening this bridge when they conducted a systematic review and identified industrial chemicals that were clearly linked to neurobehavioural adverse outcomes. At that time, 6 industrial chemicals were ‘reliably classified as developmental neurotoxicants’, 201 chemicals were reported to cause harm in adult human nervous systems and 1000 more were reported to be neurotoxic in laboratory animal studies. Grandjean and Landrigan's5 2014 update of their 2006 publication doubled the number of chemicals known to cause developmental neurotoxicity in humans to 12 based on epidemiological and clinical evidence. This number seems small compared to the magnitude of the health problem, yet the authors recognised that there may be many more where the evidence is less certain. If we really want to protect children's brains from chemicals and prevent developmental disabilities, we first need to recognise and deal with the massive dearth of basic hazard and exposure information and therefore our incomplete knowledge of the risks posed by environmental chemicals. Second, scientists and risk assessors must develop different mechanisms to identify and evaluate chemicals based on their cumulative biological effects on organs, as well as new methods to truly assess whether these compounds pose any harm to human health. In 2002, the European Parliament required that food law rely on risk assessments undertaken in an independent, objective and transparent manner that uses the available scientific evidence. However, it recognised that data were often incomplete and required that provisional risk management measures be used “where, following an assessment of available information, the possibility of harmful effects on health is identified but scientific uncertainty persists” (Regulation No 178/2002, Chapter II, Section 1, Articles 6(2) and 7(1)). Regarding food safety requirements, the law states that ‘the probable cumulative toxic effects’ shall be taken into consideration in determining whether any food is injurious to health (Regulation No 178/2002, Chapter II, Section 4, Article 14 (4)(b)). These measures were deemed necessary to ensure the high level of health protection chosen for the European Community. According to the European law, ‘food’ (or ‘foodstuff’) means “any substance or product, whether processed, partially processed or unprocessed, intended to be, or reasonably expected to be ingested by humans. ‘Food’ includes drink, chewing gum and any substance, including water, intentionally incorporated into the food during its manufacture, preparation or treatment” (Regulation No 178/2002, Chapter I, Article 2). Therefore, it is reasonable to interpret the food safety requirements so as to include food additives. Are these legal requirements also scientifically defensible? Yes, although a fundamental change in current practice must occur to fulfil them. Scientists from academia, government, regulated community and public interest organisations must come together to reform the current approach. The usual risk assessment performed for a single chemical should then be expanded to evaluate the chemical's contribution to a health outcome arising from the cumulative biological effects of multiple chemicals on the same organ, for example, the developing brain. Figure 1 is a schematic representation of the current risk assessment approach and figure 2 represents an example of an expanded analysis with a focus on health outcomes. This expanded chemical safety approach would meet the legal requirement already established in the US and EU food laws. Once either a quantitative or qualitative risk assessment is performed, it is the risk manager's job to base regulatory policy on the available data or, when information is lacking, on the uncertainty of causation of the health effect. Schematic representation of the current risk assessment approach of a single chemical. Representation of an expanded risk assessment based on the selected case study. The chemicals are examples taken from online supplementary tables S1–S3. Orange boxes represent pesticides grouped by European Food Safety Authority (EFSA); purple boxes represent chemicals approved by the Food and Drug Administration (FDA) that it identified as having an adverse effect on the brain, the thyroid gland or both in animal studies; yellow boxes represent chemicals approved by the FDA that reacted with the thyroid hormone receptor in the Tox21 assay. Since we could not find a similar analysis for food additives, we took EFSA's approach to pesticide grouping and applied it to chemicals added to food. We used FDA's Priority-based Assessment of Food Additives (PAFA) database11 to find chemicals that the agency had already identified as having adverse effects on the brain, the hypothalamus or the thyroid gland in animal studies.17 Online supplementary table S2 provides a list of 44 additives that our analysis indicates should be evaluated for their cumulative biological effect on brain development. We have found no indication that FDA or food manufacturers conducted such a cumulative effect assessment before approving the use of these additives, seemingly neglecting the legal requirement to do so. We also took advantage of additional data provided by high-throughput in vitro screening tests developed under the Tox21 program. This program uses high-throughput in vitro testing and robotic equipment to run large numbers of chemicals across a wide range of concentrations and cell types to rapidly screen them for potential toxicity. Tox21 is partnership between FDA, the National Toxicology Program(NIEHS/NTP), the NIH Chemical Genomics Center (NHGRI/NCGC), and the EPA's Office of Research and Development (EPA/ORD).18 We looked at how many food additives reacted with the thyroid hormone receptor,19 a relevant assay for brain development pathways. We found 66 additives that reacted with the thyroid receptor in the Tox21 assays: 59 of them inhibited the function of the receptor (see online supplementary table S3). In addition to these chemical used directly in foods, we also identified 107 chemicals used as food contact substances (these are chemicals that can enter food through the manufacturing process or leaching from packaging material) and 86 pesticides that also react with the thyroid receptor (data not shown). Using information available to us through (1) Freedom of Information Act request to FDA and (2) additional data found in the public domain, we have identified more than 300 chemicals that could be present in any diet in any combination that may have potential harmful effects on the developing brain. Some of them were synthetic (eg, FD&C Red 3) and some were occurring naturally (eg, vitamin D3). Chemicals added to food should not be judged a priori as hazardous or safe based on their origin; that determination should be the result of a thorough risk assessment. Furthermore, each individual chemical may or may not have a harmful effect on its own, but the reality is that we know next to nothing about their cumulative biological effects either directly on the brain or indirectly on thyroid hormone levels and therefore their real impact on the healthy development of a child's brain. Faster and more efficient screening methods complementing those developed in the USA (eg, Tox21 and ToxCast) that provide much-needed information for thousands of environmental chemicals with limited or no toxicity data. For chemicals used in food, we know that exposure occurs. Scientists have demonstrated that the risk of disease or dysfunction increases when the normal development of organs and systems, either during gestation or the early years of life, is altered by nutritional deficiencies and chemical exposures.2–23 If we are to address developmental disabilities—or other similarly rising chronic diseases like childhood asthma, diabetes or obesity—we must move beyond treating chemical exposures as isolated incidents and look at their cumulative biological effects on organs and their role in the onset of chronic diseases. The impact of chemicals on brain development and the well-being of future generations is too important to wait. Scientists should put aside what Foss Hansen and Gee24 aptly described as collective hubris, a priori assertions of safety and myopia about potential hazards. The time has come to overhaul chemical risk assessment using modern methods based on advanced scientific knowledge to fulfil the current legal requirements and truly improve public health. For the most part, the assessment of cumulative biological effects of chemicals allowed food has been ignored by risk assessors and regulatory agencies in charge of protecting public health. The current chemical risk assessment approach is deficient. It should be reviewed and expanded to more adequately estimate the true impact that the accumulation of effects of many chemicals on the same organ or system has on both the health of a person and the health of the population.
. Developmental origins of non-communicable disease: implications for research and public health. Environ Health 2012;11:42.
. Trends in the prevalence of developmental disabilities in US children, 1997–2008. Pediatrics 2011;127:1034–42.
. A research strategy to discover the environmental causes of autism and neurodevelopmental disabilities. Environ Health Perspect 2012;120:a258–60.
. Neurobehavioural effects of developmental toxicity. Lancet Neurol 2014;13:330–8.
. A strategy for comparing the contributions of environmental chemicals and other risk factors to neurodevelopment of children. Environ Health Perspect 2011;120:501–7.
. Economic impacts of environmentally attributable childhood health outcomes in the European Union. Eur J Public Health 2013;24:21–6.
. Reducing the staggering costs of environmental disease in children, estimated at $76.6 billion in 2008. Health Aff 2011;30:5.
. Developmental neurotoxicity of industrial chemicals. Lancet 2006;368:2167–78. US Environmental Protection Agency Science Advisory Board. Advice on Approaches to Derive Maximum Contaminant Level Goal for Perchlorate. 2013. http://yosemite.epa.gov/sab/sabproduct.nsf/d21b76bff879fa0a8525735a00766807/86E44EE7F27EEC1A85257B7B0060F364/$File/EPA-SAB-13-004-unsigned2.pdf (accessed Jul 2014).
. Data gaps in toxicity testing of chemicals allowed in food in the United States. Reprod Toxicol 2013;42:85–94. European Food Safety Authority Panel on Plant Protection Products and their Residues. Scientific opinion on the identification of pesticides to be included in cumulative assessment groups on the basis of their toxicological profile. EFSA J 2013;11:3293. http://www.efsa.europa.eu/en/efsajournal/pub/3293.htm. (accessed Jul 2014). National Academy of Sciences, National Research Council Committee on the Health Risks of Phthalates. Phthalates and cumulative risk assessment: the task ahead. Washington DC: The National Academies Press, 2008. http://www.nap.edu/catalog.php?record_id=12528 (accessed Jul 2014). National Academy of Sciences, National Research Council Committee on Improving Risk Analysis Approaches Used in the U.S. EPA. Science and decisions: advancing risk assessment. Washington DC: The National Academies Press, 2009. http://www.nap.edu/catalog.php?record_id=12209 (accessed Jul 2014). U.S. Environmental Protection Agency. Assessing Pesticide Cumulative Risk. 2014. http://www.epa.gov/oppsrrd1/cumulative/ (accessed Jul 2014).
. Overloaded: approaches to assess cumulative effects of food additives on brain development. Switchboard, Natural Resources Defense Council, 2014. http://switchboard.nrdc.org/blogs/mmaffini/overloaded_approaches_to_asses.html (accessed Jul 2014).
. Losing our minds: the ongoing chemicals’ attack on our children's brains. Switchboard, Natural Resources Defense Council, 2014. http://switchboard.nrdc.org/blogs/mmaffini/losing_our_minds_the_ongoing_c.html (accessed Jul 2014). National Center for Advancing Translational Sciences. Toxicology in the 21st Century. http://www.ncats.nih.gov/research/reengineering/tox21/tox21.html (accessed Jul 2014).
. Thyroid and kids’ brains: using modern tools to screen food chemicals. Switchboard, Natural Resources Defense Council, 2014. http://switchboard.nrdc.org/blogs/mmaffini/_chemical_name_cas.html (accessed Jul 2014).
. Looking back to look forward: a review of FDA's food additives safety assessment and recommendations for modernizing its program. Compr Rev Food Sci Food Saf 2013;12:439–53.
. Food packaging and migration of food contact materials: will epidemiologists rise to the neotoxic challenge? J Epidemiol Community Health 2014;68:592–4.
. Transforming epidemiology for 21st century medicine and public health. Cancer Epidemiol Biomarkers Prev 2013;22:508–16.
. Prenatal environmental exposures, epigenetics, and disease. Reprod Toxicol 2011;31:363–73.
. Adequate and anticipatory research on the potential hazards of emerging technologies: a case of myopia and inertia? J Epidemiol Community Health 2014;68:890–5. Contributors Both authors designed and wrote the article, gathered the data and performed the analysis. Funding This work was supported by a grant from The Pew Charitable Trusts to the Natural Resources Defense Council. Provenance and peer review Commissioned; externally peer reviewed. Data sharing statement The data are publicly available on the websites referenced in the text.